Bear with me as I start at the beginning of planning for an international trip. If you're a citizen of the world where they are commonplace, you'll be wondering "Who doesn't know THAT?" Well, many Americans for one thing. The United States is a large diverse country. There's plenty to see and do here. And... There's a large percentage of Americans that don't have one. I'm not sure there is an official count on this, but one estimate is that 75% of Americans don't own one. "It is a document issued by a country to a citizen of that country, allowing that person to travel abroad and re-enter the home country." Whew! Is that government speak or what. Every country issues their own. Citizens of all countries need passports to travel out of their country and into another. There are exceptions, more on that later. It generally comes as a small booklet. For U.S. citizens it is 5" x 3.5"
That first page also lists your birth date, where you were born, when and where the document was issued, when it expires and your passport number. You must sign it when you receive it for it to be valid. In the United States, they are valid for ten years for adults. For children age 15 and under they are valid for five years. The pages that follow are empty waiting to be used for exit and entry stamps. Those empty pages are also used for formal visas if they are required. Citizens in the European Union do not need their passports to pass from one country into another within the E.U. U.S. Citizens and others often do not need to show theirs, either, to pass between countries in the E.U., but you need one to GET INTO the one of the European Union counties in the first place. 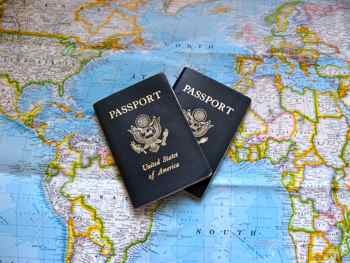 There are other other exceptions even for U.S, citizens leaving the country, but that could take a whole new page, so the best advice on exceptions is to check with the U.S. Department of State page. If you are a U.S. citizen you will need one now more than ever. You've always needed one to fly to Europe or Asia or beyond. It used to be that to get into Canada or Mexico or to most of the Islands of the Caribbean all you needed was your birth certificate and proof of identity like your drivers license. September 11, 2001 changed all that. Now you need this most official document to fly across those borders as well. To cross the borders into Canada and Mexico by land or by sea (that is driving or cruising) you currently need a passport, a passport card or a WHTI-compliant document. Or you need a government-issued Photo ID, such as a driver's license, along with proof of citizenship such as a birth certificate. More of those exceptions we talked about. Don't you love "government speak"? WHTI stands for Western Hemisphere Travel Initiative. There is a whole list of rules about what a WHTI-compliant document is. If you think you qualify for one of these, you'd better check the rules at the U.S. Department of State and be sure. Starting in July of 2008, the U.S. government began issuing these new travel cards.. These wallet-size are convenient and less expensive, but they can not be used for international air travel. Click on the above link for our explanation of what they are. YES, Children traveling with you need them. Even infants. And no... it will not help you if it is expired! Each traveler's documentation must be current to be valid. Depending on the rules of the country you're traveling to, they might have to be valid for 3 to 6 months after you return from your trip. It is up to you to make sure you have the proper documentation. You should not take the word of the airline you're traveling with or the TSA or a travel agent. They can all give you advice, but if any of them is misinformed, it's your trip that will be delayed or ruined. While I'm trying to give you the best advice I can, it's confusing and you should really check with the U.S. Department of State. The very best advice I can give you is this... If you're going to travel anywhere outside of the borders of the United States, just get a passport. Sorry for shouting. Maybe you knew most of this. It's just good to understand everything when you're planning your first big international trip. So now that you know what this magical (as far as we're concerned) document is and why you should have one, you can move on to getting one and planning your itinerary!